"Shall we pay our respects to Hölderlin today?" I ask. Robert replies: "Hölderlin? What a delightful idea! Hopefully we won't get as soaked as I did last Sunday afternoon, when a veritable deluge poured down on me. I returned to the asylum like the lousiest tramp." Today, too, despite the cold, he has brought neither overcoat nor umbrella. He looks rather raffish in his worn-out yellow-checked suit, gentian blue shirt, red-striped tie, and rolled-up trousers. We strike out briskly on the lightly snow-covered street that leads to Goßau; a white weasel shoots past, burrows a bit in the snow and peeks curiously up at us, ears perked. We speak first of the bombing of German cities. I remark that I find it disgraceful to wage war in the interior of a country, against women, children, and sick people, regardless of what nation is doing it. The fact that Hitler's people bombed London does not entitle the Allies to employ the same inhumane tactics. Robert counters fiercely, saying that I judge the situation subjectively, and too sentimentally. Anyone who is threatened the way the Britons are must turn to the most ruthless realpolitik. Hitler's Huns deserve no better. Every nation, in merely deciding to exist, becomes brutally egotistical; in this even Christianity has to take a back seat. I: "Did the civilized peoples fight back when the Italians went at the Abyssinians with bomber squadrons?" —Robert: "Allow me the observation that the Abyssinians wouldn't have fallen into that position had they resisted the temptations of civilization and had remained loyal to tradition. It's a matter of loyalty to tradition, always and everywhere!" For I don't tell the hours of the night. Across from it lies the Zum Leuen inn. We get excellent coffee and sharp Tilsit cheese. Robert asks me: "Don't you think that the proprietress comes from southern Germany? I suspect it from her dialect. Perhaps Hölderlin brought Württembergians here with him." We stop in front of the ample patrician house of the Gonzenbach family, who settled here at the beginning of the seventeenth century and grew rich in the canvas business, admiring the little tower through which the street passes, and the Venetian balconies, the quiet courtyard, the peaceful facade of the stately home with its double staircase and weathervane. The estate is now occupied by a school of home economics run by a charitable society, but Robert finds that the house has kept its painting-like quality, its grand and dreamy feel. I: "Shall we look at the Hölderlin plaque they put up last year?" Robert waves off this idea: "No, no, let us not bother with such placard nonsense! How repugnant are things that make a show of reverence. And by the way, Hölderlin's was only one of many human fates to play out here. A famous person must not cause one to forget the unfamous." 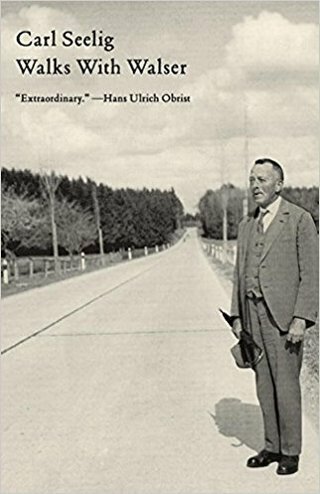 We stand gawking for a good quarter of an hour, and as we turn on a side street toward the wooded hill that separates Hauptwil from Bischofszell, we ask an elderly man who is shoveling snow in front of his house whether there are any remaining descendants of the estate's former owners. He looks at us through his right eye—the left is blind—and answers: "Yes, there's one. But he's nearly deaf and has gone a bit soft," and after a bit he adds, "People don't deserve such a splendid house, now, when they're dropping bombs on everything." I say: "Perhaps they'll improve, gradually..." The man: "Them, improve?" I: "Perhaps they'll be forced to improve!" He: "Indeed. That could be. We can only hope!" and Robert nods.